When the show on Signal Hill ends, the work isn't over for the Royal Regiment of Artillery. The men in the artillery are busy defending the city of St. John's from attack at their post overlooking the Quidi Vidi gut. 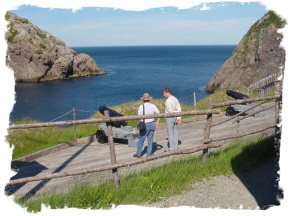 Go visit the Quidi Vidi Battery, where you will find an historic recreation of the British coastal battery. The guard house features the living quarters of the soldiers; the gun deck features two 42pdr carronades; and the site itself features a breathtaking view of the Newfoundland coast. Members of the artillery are on hand to tell you about the historic military presence in the St. John's area, and to show you how soldiers and their families would have lived in this isolated spot on the edge of the North Atlantic in the early 19th century. Lucky visitors may even stumble upon the soldiers cooking traditional meals, or live celtic music being played in the guard house! Just a five minute drive from Signal Hill and the historic fishing village of Quidi Vidi, the Quidi Vidi Battery - a Provincial Historic Site - is located at the end of Cuckholds Cove Road. Click on the map on the right for directions. The Battery is open 10:00am - 5:30pm, 7 days a week from May until Labour Day. Click here to read more about the exciting history of the Quidi Vidi Battery.